I know I promised you a post on June 1st for the official kick off to out slow summer stitching stitch-along, but I forgot about one important detail - I'm having oral surgery the morning of June 1st! I actually started the post days ago, but I've been experiencing some technical difficulties (grrr!)... I'm just about ready to throw my computer in the trash!!! So, if things are quiet around here for a while, that's why. Of course, the day isn't over yet...I just may have that post ready for tomorrow, but for now we're off to a BBQ, and I can't promise that I'll feel like dealing with the retched computer later this evening. Relaxing with my stitching sounds so much better, doesn't it? P.S. if you want to send me some positive thoughts tomorrow morning as I'm having my 4 wisdom teeth yanked out of my head, I'd much appreciate it!! Okay, it sounds like y'all are interested in this, so "slow summer stitching" is a go - yay! Above I gathered some images from the Projects from Alabama Stitch Book flickr pool. There's bunches of inspiration there! We'll officially start on June 1st, but feel free to jump in now, if you'd like. I've set up a flickr pool for us here. I also created the category "slow summer stitching" for this blog and will tag all of my posts on the subject so that you can easily find them. I'll start compiling links to various hand sewing techniques, tools and materials to share on June 1st. 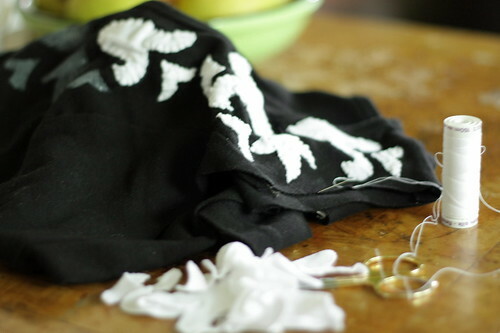 If you're having trouble coming up with something to make, some ideas are: skirts, tops, baby gowns, baby blankets, burp cloths, throw pillows, throws, wall hangings, table runners, kitchen towels, aprons, headband, wrist cuff, tote/market bag, pouch, scarf, kerchief...with these items, you can simply stencil a design then sew around it, sew around a design on a printed fabric, add traditional applique, reverse applique, relief applique, beading, embroidery, quilting, ruffles, rosettes, pin tucks...really, we could go on an on! Throughout the sew-along I'll try to choose some of these items/techniques and go into more depth on them. For now, I wanted to give you some ideas to think about. Okay friends, this is going to be fun! I can't wait to see what you all come up with!! 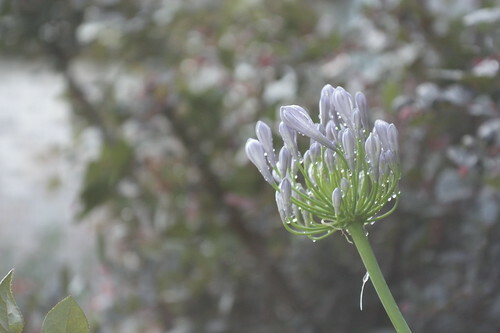 In all the time that I've had my blog (5 years this summer! ), I've never hosted a swap or a something-along. If I did, would you join me and play along? I'm thinking it will be along the lines of Natalie Chanin's Alabama Stitch. 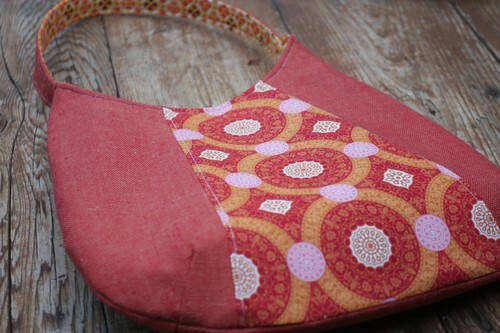 I'd like the emphasis to be on hand-sewing and taking the time to enjoy the process of completing the project. The name of the ?-along hasn't been decided yet, maybe something like "slow summer stitching". The idea will be for you to choose a project (or projects), it can be from any of the Alabama Stitch books or something you come up with on your own, and it must be all hand sewn. 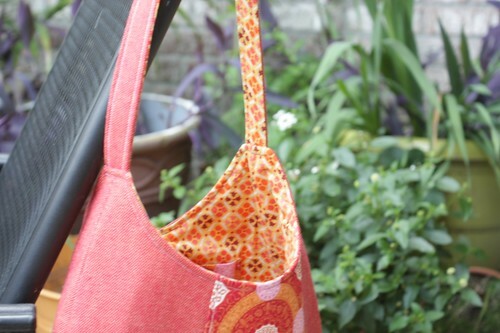 The beauty of working on this type of project is that it is totally portable - perfect for bringing on road trips or working on while watching the kids splash in the pool. This is a great opportunity to explore decorative stitches and beading. I don't want to limit the medium to knits, but if you've never tried hand sewing knits, I highly encourage you to. Even better would be to up-cycle something you already own. How does June 1 - August 31 sound? 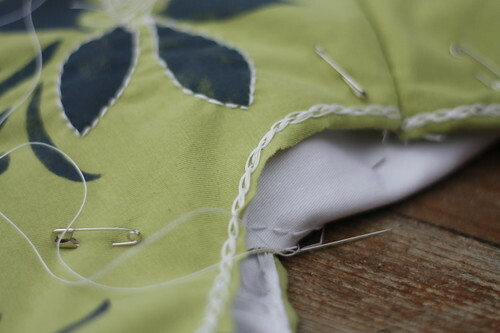 We can spend our summer with our hand sewing at our own leisurely pace. I'll start a flickr pool where we can share our progress and I'll keep a blog roll of the participants somewhere on my blog. My goal is to post once a week about my own progress, something notable in the flickr pool, or resources, links, etc that may inspire us. If you choose to participate, I encourage you to post about it as well. Personally, I think I'll be working on some pillow covers. I'll also be sharing my "slow summer stitching" with a friend, as Cathy and I have decided to meet once a week somewhere to visit with each other and work on our hand sewing. Sounds like fun, huh? If you'd like to join in or have some suggestions, please let me know! ** Let me state that you do NOT have to follow Alabama Stitch or Studio Style to participate, but they are a great source of inspiration. Also, this is NOT a swap - we'll be working on our own projects at our own pace while sharing along the way. Erin at Slipcover Your Life did an interview with me...you can check it out here. If you're not familiar with Erin, her blog Slipcover Your Life is filled with design inspiration. It's been on my reader for a while now. I especially love her Coloring Within The Lines posts - so much eye candy! Oh, she also has an etsy shop with her original cross stitch kits and finished pieces. One of these days I'm going to work one of her kits. I can't decided between the 1800's birds or the thistles, but really, I couldn't go wrong with either! 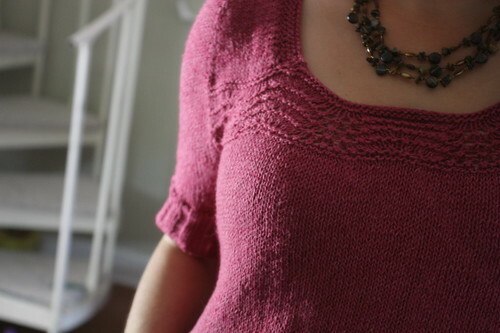 Last week I got the chance to sit down and finish up my buttercup (sorry, it's a ravelry link). Can I tell you how much I love this sweater? I've knit myself quite a few sweaters, but I don't think any have turned out as well as this. Not only does it look nice, but I feel completely comfortable wearing it, which tends to be a problem with things I make for myself. I did modify the pattern quite a bit. The pattern is written to have short puff sleeves and a loose a-line shape. I know that shape would look horrible on me, so I changed it to suit my body. I based the shape off a sweater I got from Target a few years back. It was an elbow length v-neck with wide ribbing at the sleeves and waist. That sweater was always a little too short for me, but I liked the general idea. The buttercup provided me the perfect opportunity to make a new version with a twist - it was the neckline of buttercup that caught my eye. I cast on as written, but then realized that the pattern had gathers at the back neck, which I didn't necessarily want. At that point I didn't feel like going back, so I left them in. To be honest, I am terrible at making notes of the mods I do to my knitting, so I'm recounting this from memory. In the end, I kind of like the back gathers, so that was a happy accident. To counteract the a-line shape, I added waist shaping, then knit to my desired length. 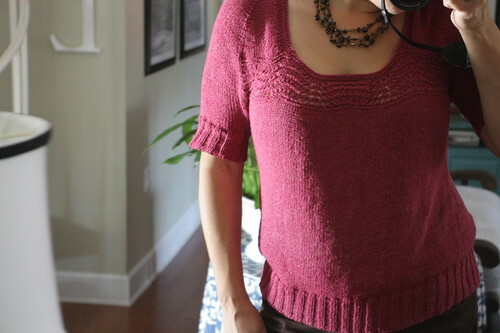 What resulted was a sweater with shaping, but not too fitted or clingy - just perfect. I did try this on many times during the process to get the right fit. I was afraid that my neckline was too large, but adding additional rows of garter stitching (I think I did 7-8 total) and picking up less stitches than called for along the neck helped pull it in. I couldn't be more thrilled with the result. The yarn is Callista from elann, a linen/rayon/cotton blend. 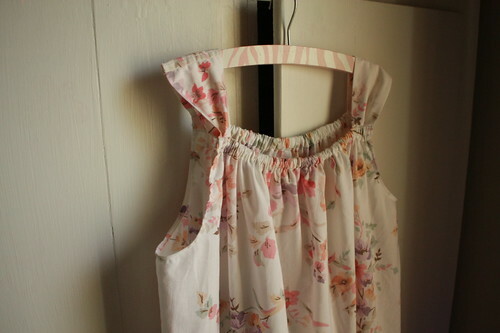 It is so soft and drapey and quite comfortable to wear. Unfortunately, this yarn is discontinued, which is a bummer because I'd love to make more things with it. I feel like a broken record in saying this, but time is going by way too fast! Today, my first born turns nine. NINE - how in the world did that happen? Wasn't she just eating dirt while helping me work in the flower beds? I've been thinking a lot about what I'd write about her on this special day, and I must admit that this post is tough. I'm so full of emotion and pride, I don't know where to start. How did I get so lucky to have such a smart, sensitive, funny, beautiful daughter? Lily is a constant surprise to us - she has been since the day she was born (entering the world at a whopping 10 lbs 2 oz). I remember at her first Dr. visit the pediatrician saying that she seemed so mature for her age (just what you want to hear about your 2 week old daughter!). This has proven to be the case to this day. Though she is only 9, she is wise beyond her years. Did I mention that she's smart? She doesn't make a big deal about it, but she is. And she's not just book smart, she gets it. I'm already blown away at some of the conversations we've had. I've watched my girl grow up a lot over this past year and I'm pretty darned pleased at the person she's becoming. I look forward to watching her continue to blossom and I feel honored to be able to witness it. I have no doubt that she'll continue to be as extraordinary in the future as she always has been. 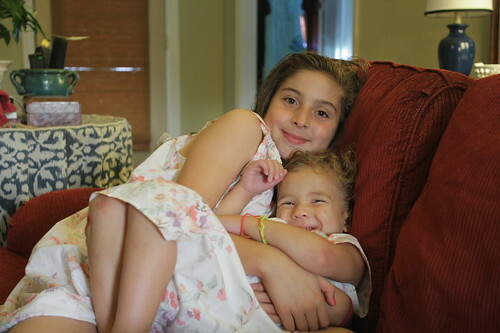 Happy 9th Birthday, Lily. I love you!! Hello friends! I hope that you all had a lovely weekend. Mine was spent preparing for and entertaining some very noisy little girls, but it made a certain birthday girl very happy, so it was all worth it :-) My goodness, 9 yr old girls sure can scream and giggle! I'm glad that we decided to send the little brother & sister away or else I don't think anyone would have gone to bed...and there would have been a LOT more screaming. I've got lots of crafty stuff to share this week, but I think I'll start with my latest bag, which I like to call 'hot tamale'. Don't you think that is appropriate? I revised this pattern to get the proportions just right, and I'm pretty sure I nailed it. This bag feels right, which is how I determine if a bag is good or not. Real scientific, huh? 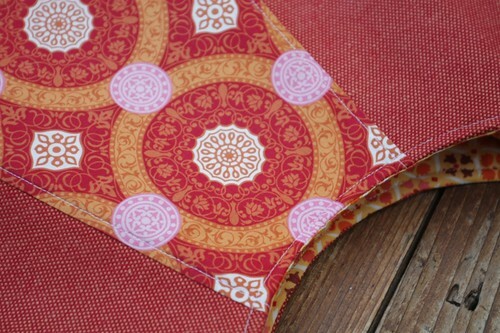 I made the exterior from a durable decorator fabric I bought a few years ago, paired with a medallion quilting cotton. I even splurged and used a denyse schmidt print to line the bag because it seemed perfect. 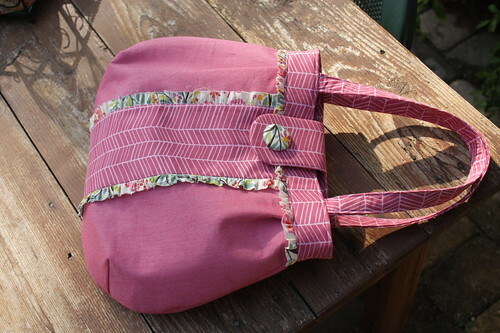 I think this is a perfect summer bag. Because I already have my bag, I've decided to let it go, along with a few others. It's time to fall back to an oldie but goody - gratitude friday. I do believe a gratitude friday is long overdue. Things around here have been pretty darned good, but very busy and a bit chaotic at times. 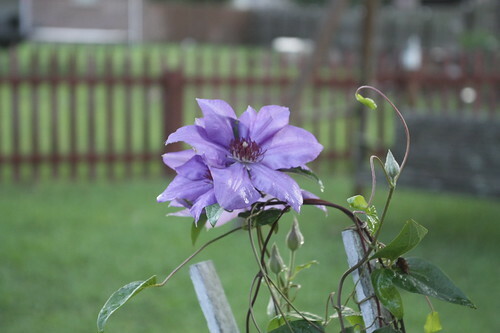 When the busy and chaos start to overshadow the good, I know it's time to pull back and set things back in focus. TGIF! Have a great weekend, friends!! I’ve been doing a lot of thinking about my reconstructed shirt for the class I’m taking. As I mentioned in the last post, the first class was a review of hand stitches, but this next class we are to bring in the shirt that we plan to reconstruct. I haven’t exactly decided how I’m going to reconstruct my shirt, but I do plan to use relief appliqué to adorn my shirt. This technique is described in Studio Style. I could have easily used the stencil provided in the book, but I like to make things my own. I wish drawing and doodling came easy to me, but it does not. Coming up with any sort of graphic/surface design is quite a challenge. In order to come up with a stencil, I needed inspiration from somewhere, so I grabbed a few of my favorite dishes. Using the surface design as my starting point, I sketched a few shapes that spoke to me. Because I’m going to be cutting and sewing these shapes, I didn’t want anything too intricate or tiny. Once I had some shapes that I thought would work together I cut them out, then played around with their placement. At first I thought I wanted something clustered and somewhat random, but in the end I went with symmetry. My overall design is too large for what I have in mind for my shirt, but the beauty of using a stencil is that you can pick & choose which parts you want to use. I’m sure I can position this on my shirt to come up with nice design. My final step was to transfer my design to something rigid, which ended up being a manila folder (it’s what I had on hand), then cut it out. The reason I have two stencils is because I’m doing relief appliqué. 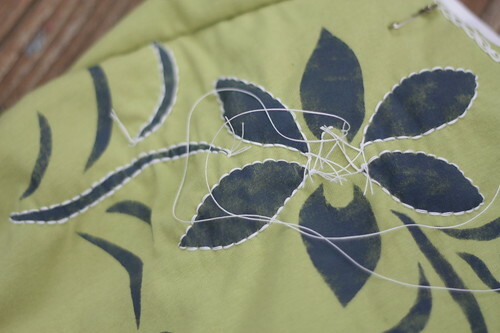 One is smaller than the other – the relief part is created by sewing on the larger appliqué within the smaller shape, which is traced onto the shirt using the smaller stencil. This technique looks beautiful in the book, I hope that mine turns out half as nice! 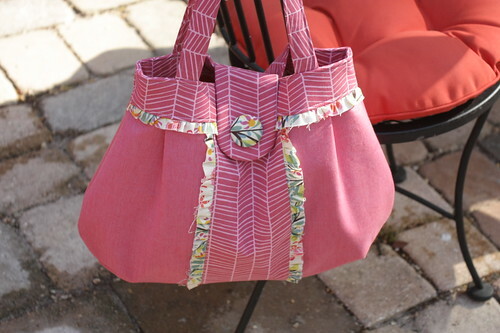 Well friends, I finally did it - I made MY summer bag. After tweaking this one, I came up with the perfect combination for me. I stayed up way too late Thursday night to make it, but I don't think I could have gone to bed early if I had wanted to. On Thursday evening I attended my first Reconstruction sewing class. I can't tell you how fun it was being in that setting. The first class was a bit of a review for me, though I did finally learn how to do a french knot, but I look forward the next classes when we start working on our reconstructed top. I'm still in the planning stages right now. On Saturday morning I cleaned out my closet. Oh boy, was that ever needed. I now need to make a huge haul to Goodwill, but I saved quite a few things to re-purpose. All those worn out knit t-shirts will be great for applique, some of which I'm sure will make it to my reconstructed top. Oh yes, back to the bag - I LOVE it! 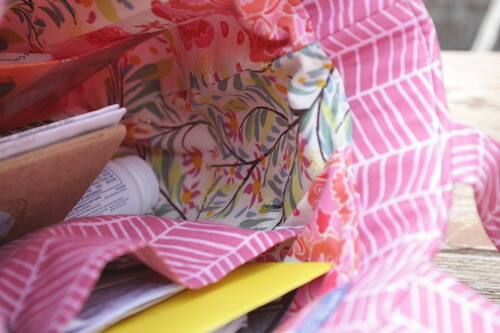 It is roomy enough for all my stuff and pretty in pink, but not sugary sweet. Also, I'm loving that ruffle. 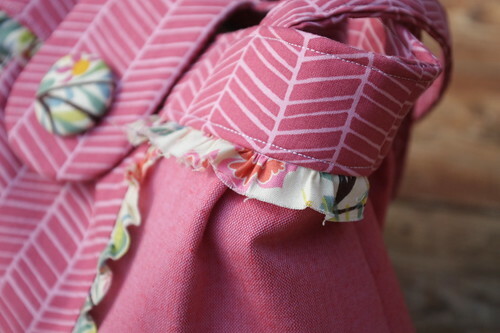 My next few bags will have ruffles, for sure. 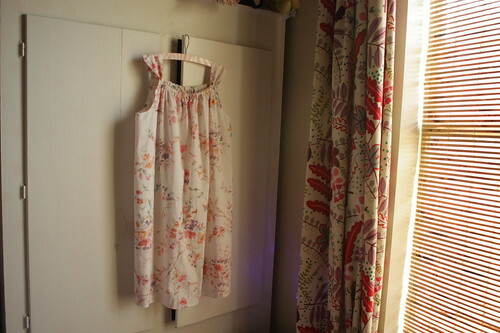 Sunday afternoon I wrapped up my kids clothes sewing week with Lily's gown. I made this on the fly using one of her existing dresses as a guide which resulted in having to make many revisions along the way. The first run turned out way too big with too big arm holes and too long straps. So, I ripped, shortened the elastic at the front & back and shortened the straps. It's not perfect, but it works. I probably would have done better keeping the too big one for myself and making her a new one (yes, it was that big!). Ava was thrilled to have a matching gown with her sister. Now all I need to do is make myself a version, then we'll all be set (and look, I think it might even match my new bag, hee-hee).